Correctional experts of all political persuasions have long understood that releasing incarcerated people to the streets without job training, an education, or money is the perfect formula for recidivism and re-incarceration. While the fact that people released from prison have difficulties finding employment is well-documented, there is much less information on the role that poverty and opportunity play in who ends up behind bars in the first place. Using an underutilized data set from the Bureau of Justice Statistics,1 this report provides hard numbers on the low incomes of incarcerated men and women from before they were locked up. Figure 1. Median annual incomes for incarcerated people prior to incarceration and non-incarcerated people ages 27-42, in 2014 dollars, by race/ethnicity and gender. Figure 2. Percentage difference between the median annual incomes for incarcerated people prior to incarceration and non-incarcerated people ages 27-42, in 2014 dollars, by race/ethnicity and gender. While the gap in income is most dramatic for White men, White men have the highest incomes. By contrast, the income gap is smallest for Hispanic women, but Hispanic women have the lowest incomes. Figure 3. 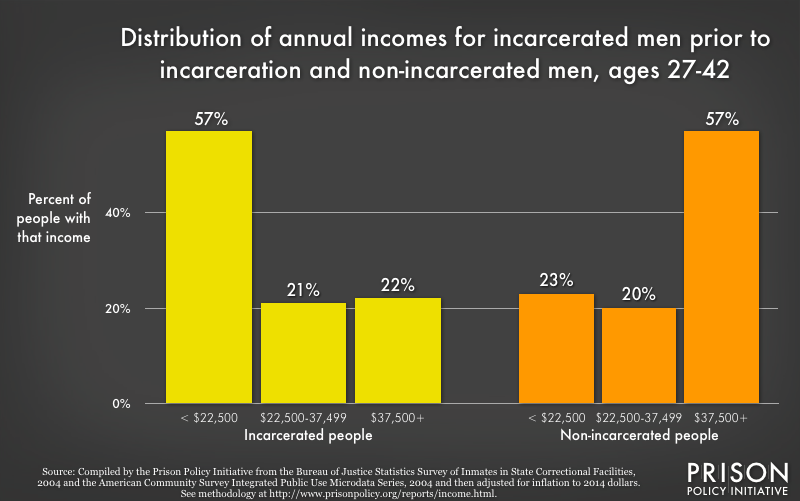 Incarcerated men are concentrated at the lowest ends of the national income distribution. The median incarcerated man had a pre-incarceration income that is 48% that of the median non-incarcerated man. Figure 4. 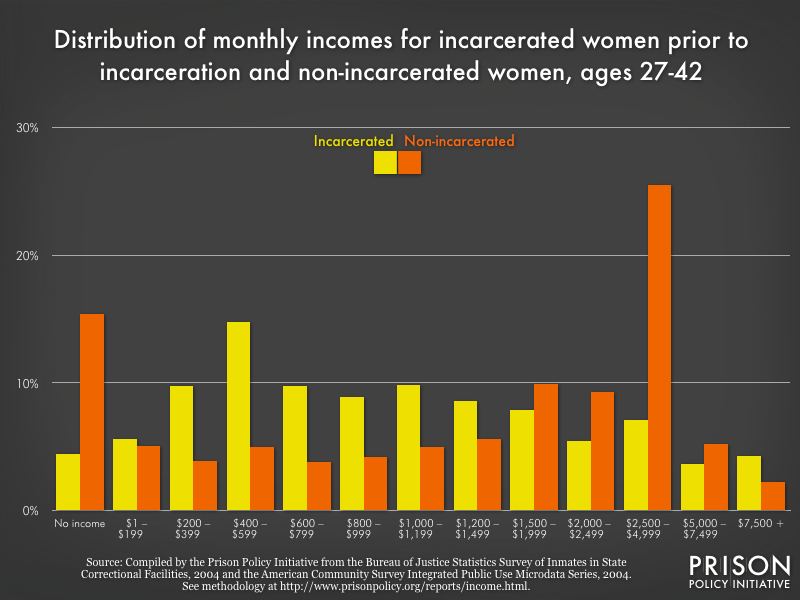 Incarcerated women are concentrated at the lowest ends of the national income distribution. The median incarcerated woman had a pre-incarceration income that is 58% that of the median non-incarcerated woman. Our society has, in the name of being tough on crime, made a series of policy choices that have fueled a cycle of poverty and incarceration. We send large numbers of people with low levels of education and low skills to prison, and then when they leave just as penniless as they were when they went in, we expect them to bear the burden of legally-acceptable employment discrimination. Acknowledging, as this report makes possible, that the people in prison were, before they went to prison, some of the poorest people in this country makes it even more important that we make policy choices that can break the cycle of poverty and incarceration. This is not the first report to address the incomes of incarcerated people. The Bureau of Justice Statistics (BJS) collects this data periodically (most recently in 2004 with another survey scheduled for 2015–2016) but does not routinely publish the results in a format that can be accessed without statistical software.7 The BJS last published a complete analysis8 of the survey results in 1993 and used the 2004 data in a narrower study of incarcerated parents of minor children.9 Sociologists Bruce Western and Becky Pettit used a portion of this same data set in their groundbreaking books and articles on the impact of incarceration on men. Our intent in this report has been to make this data for both men and women available and accessible to the public. This report was not intended to make the point that incarceration causes poverty, although there is extensive research on that topic (see below for recommended reading). Because the Prison Policy Initiative is regularly asked about the role that poverty plays in who ends up behind bars, this report is aimed at answering a different question: are incarcerated people poorer than non-incarcerated people? In particular, we wanted to address questions like the morality of allowing private telephone companies to charge the families of incarcerated people $1/minute for phone calls home from prisons and jails. To be clear, this report relies on the Bureau of Justice Statistics survey from 2004, which is both quite old and the newest available. While we look forward to the Bureau of Justice Statistics releasing the raw data from their 2015–2016 survey in two to four years, we know of no reason or trend that would make relying on the 2004 survey less reliable than the alternatives of using data from 1993 or no data at all. Further research should look at the effects of educational attainment and prior sentences on pre-incarceration incomes and identify policies that could address those disparities. This report is the result of a collaboration between Bernadette Rabuy, Policy and Communications Associate at the Prison Policy Initiative, and data scientist Daniel Kopf, who joined our Young Professionals Network in February 2015. Together, we studied the BJS Survey of Inmates in State Correctional Facilities, 200410 relying in particular on the questions listed below and then developing a way to make the data comparable to non-incarcerated people. Notably, our data only includes the incomes of people incarcerated in state prisons, not federal prisons or county jails. S7Q11c. Which category on this card represents your personal monthly income from ALL sources for the month before your arrest? S1Q2a. What is your date of birth? S1Q3a. Are you of Spanish, Latino, or Hispanic origin? S1Q3c. Which of these categories describes your race? Because income is correlated with age and because the incarcerated population trends younger than the general U.S. population, we thought it would be most accurate to compare people of similar ages. We limited our study to the 25th and 75th percentiles of ages for incarcerated people (ages 27–42), and we used the same age range for the non-incarcerated population. Note that throughout this report, the incomes for incarcerated people are the incomes incarcerated people reported earning before their arrest, not the incomes they earned through prison labor. For incarcerated people and non-incarcerated people, incomes include welfare and other public assistance. For incarcerated people, incomes also include illegal sources of income. We use "Non-incarcerated" to refer to people in households, and thereby exclude people in group quarters, including people in correctional facilities, psychiatric hospitals, college/university housing, or residential treatment facilities. Our data on "Blacks" and "Whites," relies on data for Non-Hispanic Blacks and Non-Hispanic Whites. 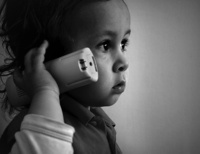 The federal government defines Black and White as races while Hispanic is defined as an ethnicity (and, therefore, it is possible to identify as both Hispanic and White or Hispanic and Black). Our data for both incarcerated people and non-incarcerated people allowed us to avoid overlap by separately talking about Non-Hispanic Whites, Non-Hispanic Blacks, and Hispanics. 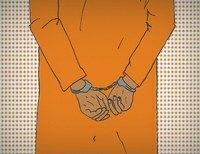 Visionary research by sociologists Bruce Western and Becky Pettit has also relied on this same 2004 BJS state prison data set in order to provide a more realistic picture of the plight of young black men in the U.S. Western and Pettit have also utilized data from the other BJS surveys of inmates (Survey of Inmates of Local Jails or Survey of Inmates of Federal Correctional Facilities) and the National Longitudinal Survey of Youth to fill the gap in data left by government sources such as the Census Bureau's Current Population Survey (CPS). The Current Population Survey is the large monthly labor force survey conducted by the Census Bureau, but, because it only considers households, the CPS excludes incarcerated people. The Economic Mobility Project and the Public Safety Performance Project, Collateral Costs: Incarceration's Effect on Economic Mobility (Washington, D.C.: The Pew Charitable Trusts, 2010). The 2004 BJS survey asked incarcerated people what their personal monthly income was the month before their arrest. The data in this appendix is presented in monthly incomes and has not been adjusted for inflation. The following tables and graphs allow for comparisons between the incomes of incarcerated people prior to incarceration and the incomes of non-incarcerated people for each of the income categories that BJS provides respondents in its Survey of Inmates in State Correctional Facilities. The graphs also show that incarcerated people are dramatically concentrated at the lower ends of the national income distribution. Figure 5. Median monthly incomes for incarcerated people prior to incarceration and non-incarcerated people ages 27-42, in 2004 dollars, by race/ethnicity and gender. Figure 7. 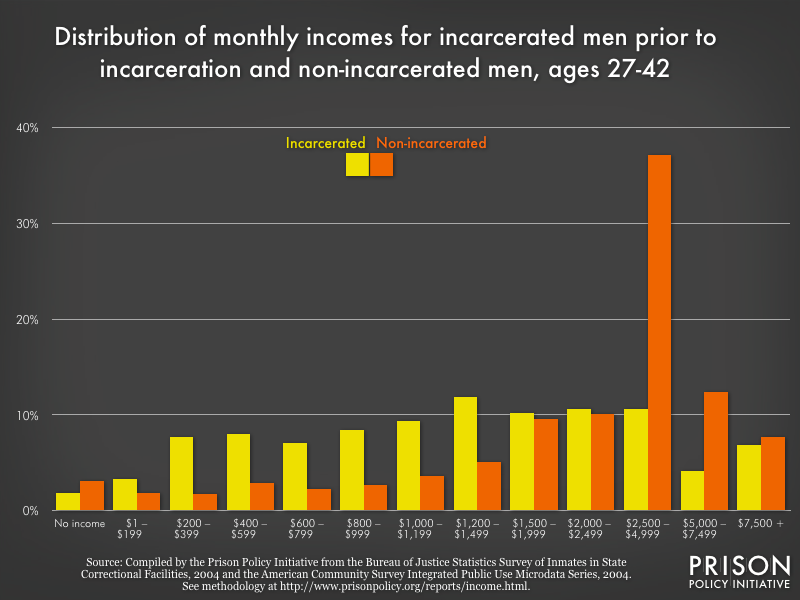 Proportion of incarcerated men (prior to incarceration) and non-incarcerated men that fall within an income category. Figure 8. Distribution of monthly incomes for incarcerated women prior to incarceration and non-incarcerated women in 2004 dollars, ages 27–42. While most incarcerated people make less prior to incarceration than people on the outside, there is one interesting anomaly in the data for women not present in the data for men. More non-incarcerated women report no income at all than incarcerated women prior to incarceration. For both groups, the reported incomes include wages, welfare, and other public assistance, but since these are individual surveys, they do not include spousal income. It is likely that many of those non-incarcerated women with zero reported income are receiving support from their spouses. Figure 9. 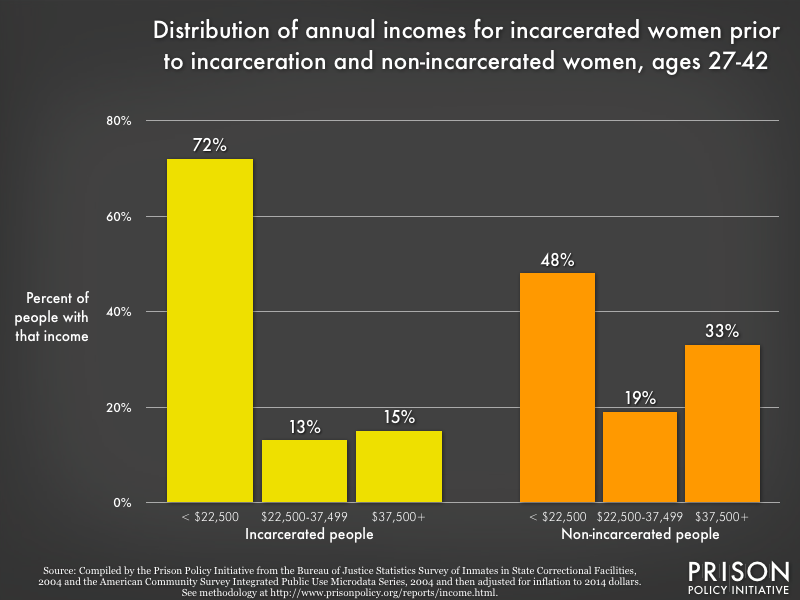 Proportion of incarcerated women (prior to incarceration) and non-incarcerated women that fall within an income category.